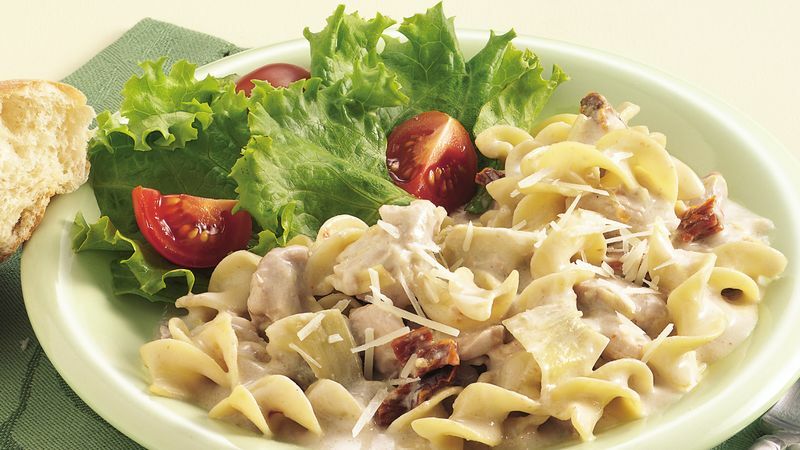 In 3- to 4-quart slow cooker, mix chicken, artichokes, pasta sauce and water. Cover; cook on Low setting 5 to 6 hours. About 25 minutes before serving, stir tomatoes and uncooked noodles into chicken mixture. Increase heat setting to High; cover and cook 15 to 20 minutes longer or until noodles are tender. Sprinkle cheese over individual servings. Pasta quickly absorbs the sauce in this dish if it has to stand before serving. For a creamy consistency, stir in a little hot water.